The 15 Most Romantic Places in Utah! Impressing your significant other on date night isn’t always easy, but it will be if you’re in Utah, where the natural scenery is enough to leave anyone swooning. These 15 spots are among the most romantic in the state. Home to a museum of ancient life and a collection of adorable farm animals, Thanksgiving Point is also one of the state’s most romantic locations. Due mostly in part to the institution’s Ashton Gardens (55 acres of “stately gardens”), Thanksgiving Point’s romantic ambiance is completely effortless. Dinner at the establishment’s renowned Harvest Restaurant is the cherry on top. Conveniently located in downtown Salt Lake City, Pallet is the perfect place for some romantic eats. Due to its dimly-lit and rustic ambience, the restaurant gets fancy but not too fancy and sets the stage for an extremely romantic evening. One of Utah’s ritziest restaurants, La Caille is also nestled in the beauty of Little Cottonwood Canyon. With its own winery and a sizable menu of European-inspired delicacies, you’ll want to come to La Caille in your very best attire. Home to various romantic restaurants and interesting shops, the Shops at Riverwoods in Provo is especially romantic during the winter months, when it is illuminated by a generous collection of streaming lights. Although there are crackling fires to keep you warm, you’ll want to bring your mittens and some breath mints. An intimate resort under the spectacular shadow of Mount Timpanogos, Sundance Mountain Resort is home to fine dining, luxurious lodging, well-maintained ski resorts, and a remarkably cozy atmosphere. During the autumn months, a moonlit ski-lift ride is a sure-fire ticket to enviable romance. With its dramatic chandeliers and all-consuming acoustics, Abravanel Hall is the veritable highlight of a romantic night on the town in Salt Lake City. Home to the Utah symphony, Abravanel Hall is also home to some serious hand-holding. Overlooking Salt Lake City’s famous Temple Square, the Roof Restaurant is famous for its gastronomical fare, its views, and for all the proposals that take place here on the top floor of the Joseph Smith Memorial Building. After taking a dip in the Homestead Resort’s natural hot spring, you can return with your loved one to the comfort of a roaring fire in a cozy mountainside suite for two. If you’re there during the winter months, make sure to take her ice skating at Midway’s very own outdoor ice-skating rink. It doesn’t get much more romantic than the St. Regis at Deer Valley Resort in Park City, Utah. 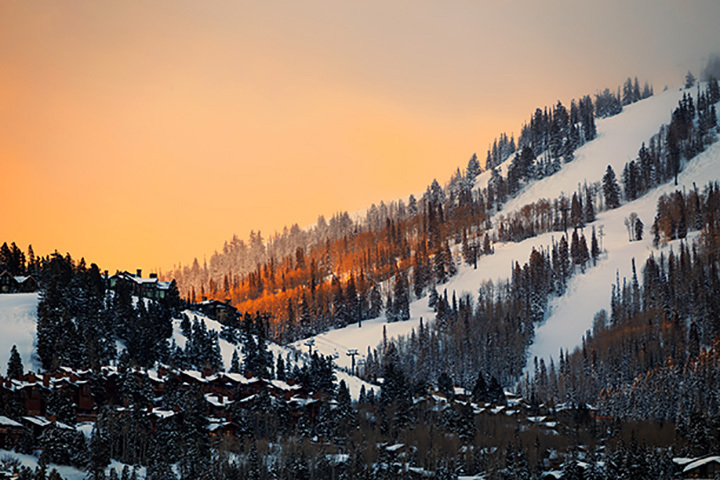 Utah’s fanciest ski resort, Deer Valley is home to some seriously stunning views. Don’t worry about the crowds because Deer Valley limits how many people can be skiing at one time. If things do get too crowded, the St. Regis offers plenty of privacy and complimentary bathrobes. Located in the sleepy Southern Utah town of Boulder, Hell’s Backbone Grill is an award-winning restaurant with simple yet hearty dishes sure to appease the pickiest of eaters. After a romantic hike in Utah’s red rock country, take a shower and then take a moment to enjoy this grill’s offerings. Arguably the best restaurant in St. George, the Painted Pony is expensive but for good reason. With dishes like bacon-wrapped duck and rosemary-spiked ribeye, the Painted Pony offers some of the fanciest food in Southern Utah and is sure to give you a bang for your buck when it comes to full-fledged romance. It may not be a suit and tie affair, but Lagoon Park in Farmington offers fun-filled romance with a side of funnel cake. Utah’s only amusement park, Lagoon is home to thrilling rollercoasters and mini carnival games, giving you plenty of opportunity to win that giant teddy-bear for your crush. If you’re looking for romantic lodging in Southern Utah, ditch the campsites and head over to Red Mountain Resort in St. George where you can unwind after a day of golfing, swimming, and hiking. Spending quality time with your significant other is easily romantic when you’re in the middle of the desert watching magnificent sunsets. There aren’t many things more romantic than sharing dessert with your sweetheart. The Chocolate Dessert Café is famous for shareable desserts, such as its popular “Cazookie,” which features a massive, warm, gooey chocolate chip cookie baked to buttery perfection in a pie tin. The kicker? Two scoops of melty vanilla ice cream on top. Sometimes the most romantic moments involve little money. Such is the case with the Alpine Loop scenic drive, which connects Provo and American Fork Canyons. Particularly stunning in early autumn, the drive is nevertheless enjoyable all year-round. If you’re looking to get away from the hustle and bustle of Utah Valley, head to the mountains with someone special and bask in the romance of mother nature.